Domo-kun is a little hard to describe to those who’ve never laid eyes on him (he’s that giant, brown oviparous monster you might have seen chasing kittens in Internet memes…), but that oddity hasn’t kept him from amassing a following not only in his home country of Japan, but all around the world. 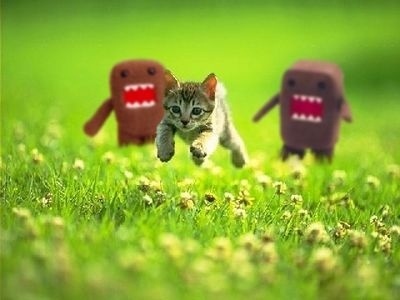 In fact, there are several sites dedicated to this fuzzy, brown rectangle where Domo-kun fans can submit their own memes and videos featuring the character. Despite a noticeable lack of ears, this devotion hasn’t escaped Domo-kun’s attention, and he would like to show his appreciation to all his fans by opening a limited time restaurant in the Lumine Yokohama store right outside Yokohama Station. ▼ DOMO Diner, you have a phone call, it’s Wendy’s on the line. ▼ Items ① – ④ come with the original DOMO diner mug and ordering a drink gets you the original coaster! The fun doesn’t end with making food that looks like Domo-kun. Popular Japanese retailer Village Vanguard will also establish a special corner in its stores for all sorts of Domo-kun goods, such as limited-edition merchandise inspired by the diner as well as items for his upcoming series Life is Domo. The restaurant will be open from January 25 to March 9, so be sure to head to Yokohama to get a taste of Domo-tastic food and fun.